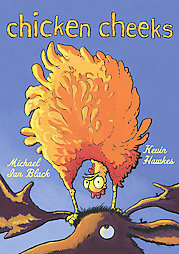 I read Chicken Cheeks a couple of weeks ago when it first arrived in stores. And I haven’t been able to get it out of my head because it’s hilarious. Hilarious in a way that sort of lingers with you. I read it and thought it was funny at the time, but then over the next couple of weeks I’d find myself randomly saying things like “Moose Caboose” and laughing out loud when I remembered the story. This is the story of a bear who really wants some honey, so he gets all the other animals to build a giant tower to reach the beehive in the tree. As the tower gets bigger, we are introduced to each animal’s backside (“Deer Rear”). Then all the animals meet a surprise behind at the top. It is all about rear-ends, and I know without a doubt that my preschoolers would be on the floor in hysterics over it. And it’s written by Michael Ian Black, who is one of the funniest people alive, and illustrated by Kevin Hawkes (who wrote my treasured Library Lion). Little kids find nothing funnier than body humor, and Black has clearly observed this. It’s a hoot.